Hi there! 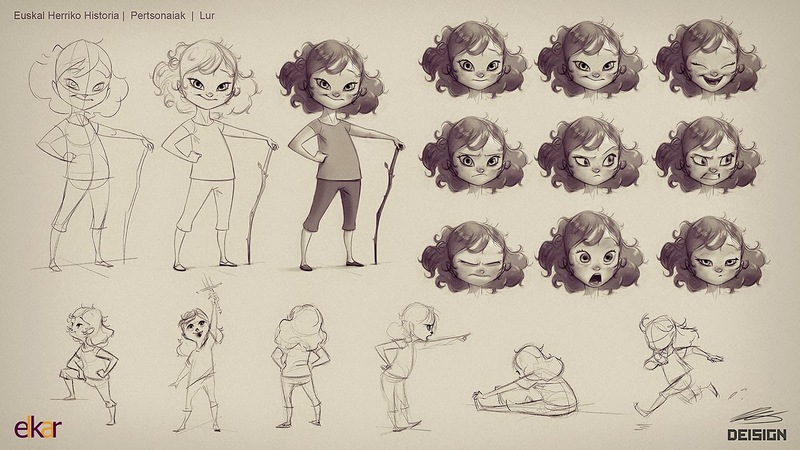 So it seems I can now share with you this Character Design project I did almost a year ago. 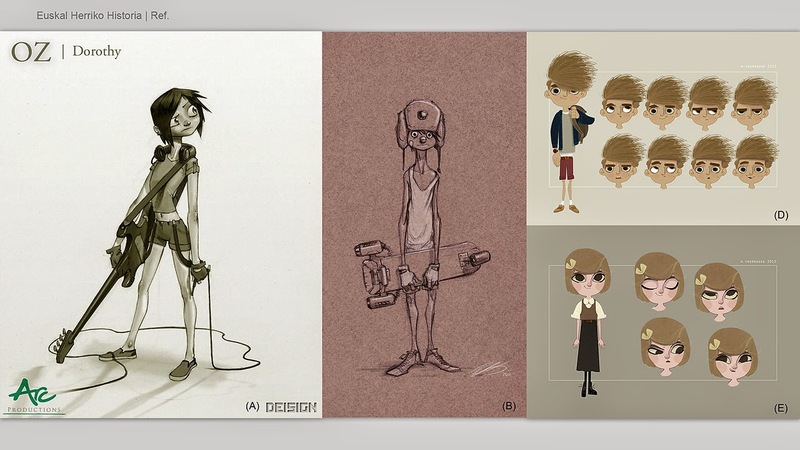 Bellow you'll find a narration of what I was presented with and what the process of creating these characters was like. I hope you find it insightful! 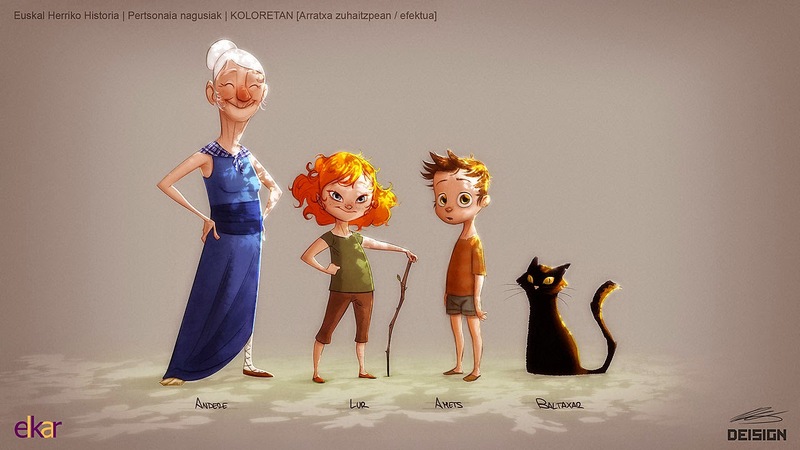 So last winter, a publishing company from the Basque Country called ELKAR asked me to design the lead characters for a series of illustrated books, which could potentially turn into an animated project as well*. I was in Canada at the time, but being Basque myself, they tickled my motherland-pride (heh) and got me interested (and somewhat homesick) right away. However, I made sure to leave emotions aside, and negotiate a solid deal, for the work that I was going to have to do. After some wrestling, my bid was accepted and we were on our way! 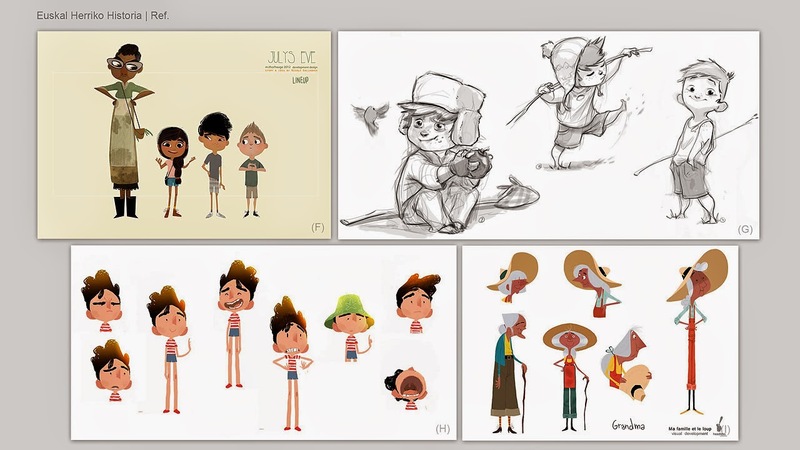 *The fact that the illustrated project could potentially evolve into an animated series, meant the designs would need to function in both mediums; as well as providing model and expression sheets. The lengthy historic timeline implied that either the characters would need to have multiple different costume designs, or a neutral attire that could fit in different time periods. The client chose the latter. So the first thing I did was to visualize in my mind what I imagined the characters to be like as I read the stories. 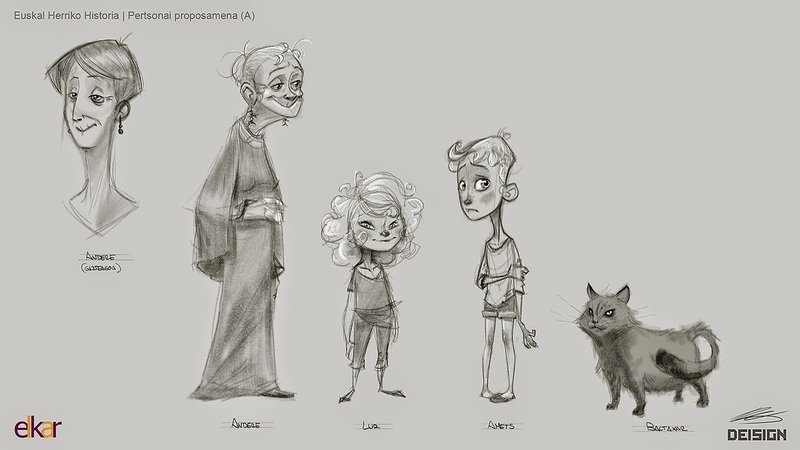 That gave me a "feel" for the characters to help me inform my design choices further down the process. Then I gathered some reference along the lines of what I was envisioning (See bellow) to get the client's thoughts on it and see if we were on the same page. CREDIT: Some of the images above belong to the great Marie Thorhauge, others are the work of the always amazing Headless Studio, and the rest are old sketches of mine from different projects. 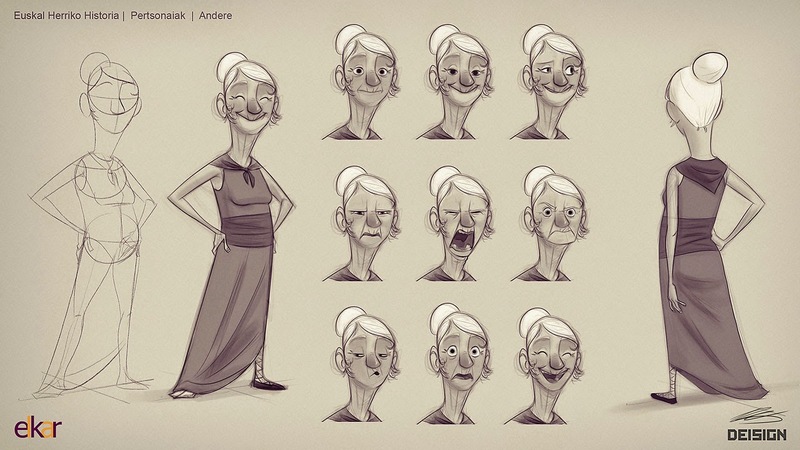 Option A had more of an old-timey feel and was more geared for a traditionally animated project eventually. 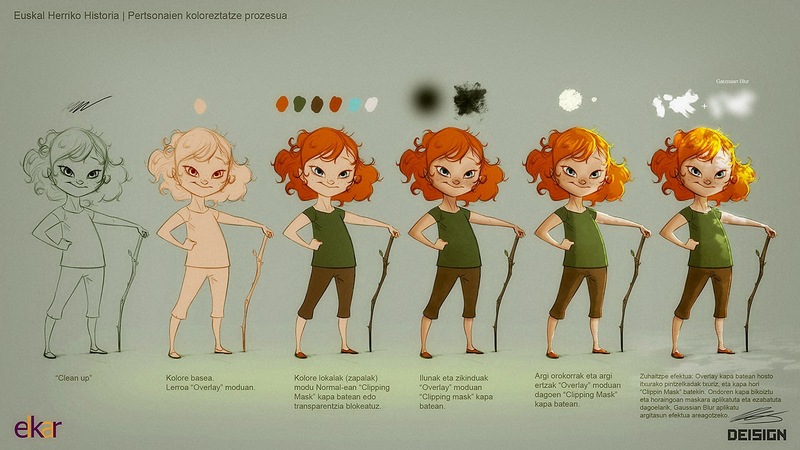 Option B was a bit more solid and stylized, and would be more CG or ToonBoom friendly. 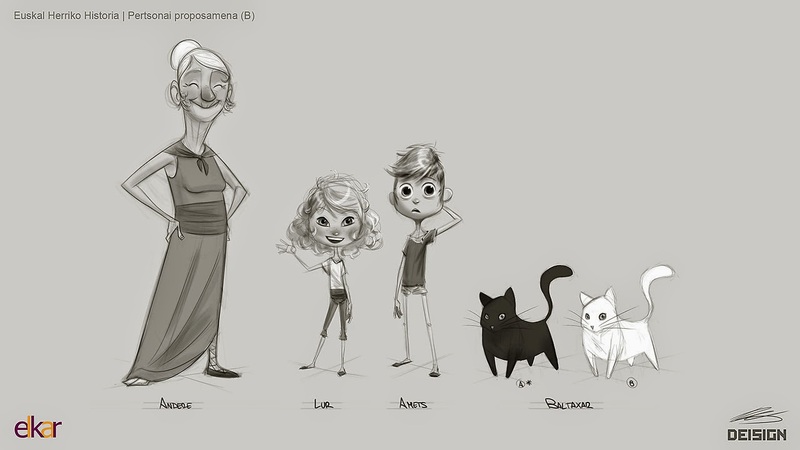 Option B was favored by the client; they loved the Grandma, but some notes were given about all three other characters that needed to be addressed in another iteration (Bellow). I pitched this one as the potential final line up, and luckily they loved it! Something to note, design-wise, is that there was an underlying mystical touch to these characters in the writing, which I wanted to make sure translated onto the design. For instance, Grandma (Andere) has a duck-like right foot that she discreetly conceals with her clothing: In the story, she's a half "rivermaid", a common creature in Basque mythology. The clothing I chose for her is inspired in a traditional attire, which used to be worn by women in coastal towns in the Basque Country, and is still worn today during traditional festivities. The other characters weren't inherently mythical, but I felt like I wanted to infuse their designs with a bit of that same feel. Specially that of the girl (Lur), as she was described as the more adventurous and closer to her Grandma. I pushed her feline features to resemble how gnomes and elfs are often depicted in Basque mythology. The cat (Baltaxar) was described as being darkly colored or black, but I chose to push that feature by making him pitch black, to the point where his inner features are lost into a silhouette. 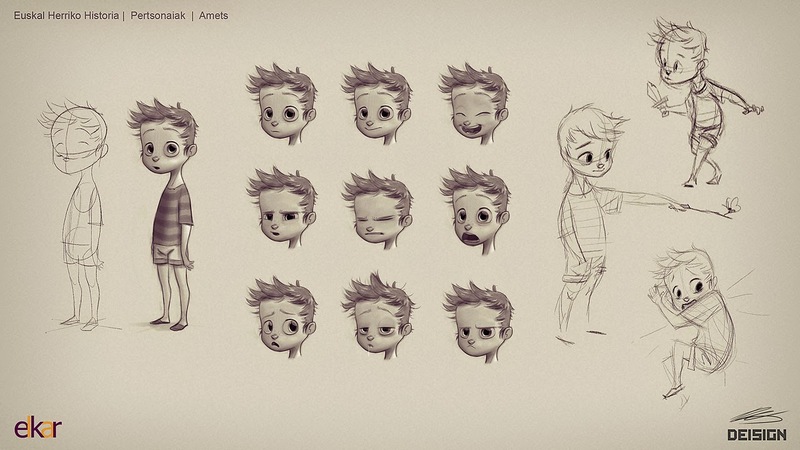 I made the boy, Amets, the most neutral of all, as he was described as the more cautious and somewhat fearful of all characters; and so he would feel a bit out of tune with the feel and pace of the other more confident characters, even from a design point of view. 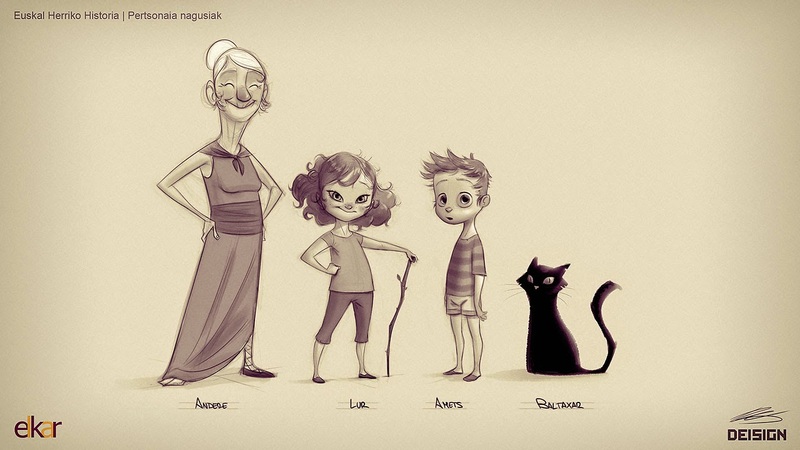 Baltaxar, the cat, was an interesting character to work on. Building on the idea of him always being seen as a black silhouette with eyes and nose... I pitched the client the idea that he could perhaps move as a shadow over very few frames (thinking about animation here), leaving a stylized trail, and even disappear when entering dark places, with only his eyes, nose and whiskers being visible. A bit of a "Cheshire Cat" effect, if you will. The client was on board this idea as soon as the model sheet above was presented to them. 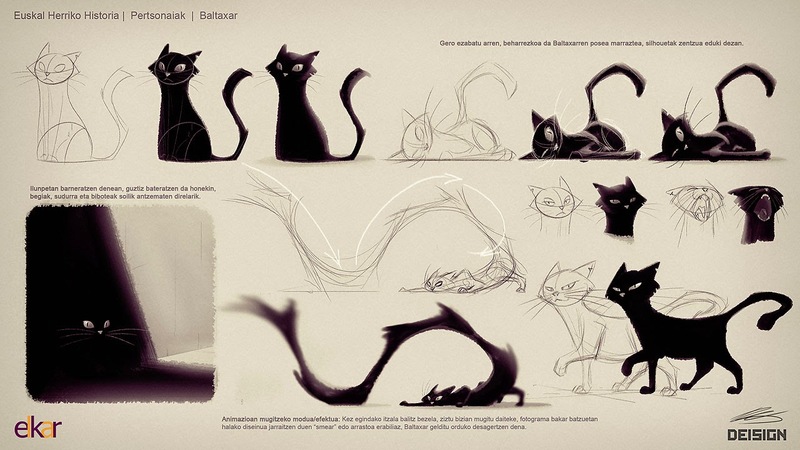 As you can see on the model sheet, as Art Direction note to any artists coming into the project down the road, I recommended for the structure and limbs of the cat to be sketched, even if they were eventually going to be lost within the blackness of the silhouette, as this would help the overall shape make sense and read better. At this point, I was able to create a color version of the character line up, for which developed color charts for different times of day. You can see a couple of those bellow, including a step by step chart I made describing the process I followed to achieve that look. Base color. Line art in Overlay mode. Local colors (solid) in Normal mode, on a clipping mask or with transparency blocked. Darks and "stains" on Overlay mode, also on a clipping mask. Lights and Rim Light on overlay mode, also on a clipping mask. For the "Through-the-trees highlights" effect, create some white marks with an irregular brush on Overlay mode. Duplicate that layer, apply and delete the mask so transparency is no longer restricted, and then apply a Gaussian Blur effect to that layer, in order to achieve that luminous look. And that's it! I hope you enjoyed the post and hopefully found it insightful in some way! Thanks for stopping by and feel free to ask anything or comment! Cheers! This project is so beautiful, and your breakdown of the process is wonderful! I love seeing your works in progress especially, whether it's written down and illustrated, or in video. No matter what, your work is incredibly inspiring, thoughtful, and motivating! I've been following your work for a long time now, and it continues to amaze me. I don't say it enough: thank you a thousand times for sharing your work! Hi, just wanted to thank you for taking out the time to do this. The work is just stunning and the process is inspiring! !